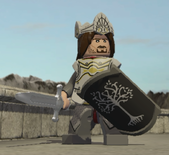 This article is about the minifigure from The Lord of the Rings. 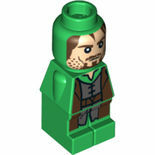 For the Marvel Super Heroes character, see Aragorn (Marvel Super Heroes). 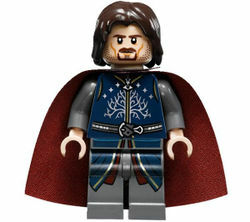 Aragorn is minifigure from the theme The Lord of the Rings first released in May 2012. As of now, he has appeared in four sets; 9472 Attack on Weathertop, 9474 The Battle of Helm's Deep, 79007 Battle at the Black Gate and 79008 Pirate Ship Ambush and in the video game. He has been released in two versions. Aragorn's head is double-sided; one side has an angry or focused expression, while the other side has a more neutral expression. His body and legs have printing of a dark brown jacket over a sand blue tunic. His legs are dark sand. The tunic is held by two brown clasps and brown belt, the printing of which continues onto the leg piece. On the back of the body are several lines indicating wrinkles on the jacket. In both of the sets he comes in, he has a sword piece, and in Attack on Weathertop, he also has a torch made up of a flame and a dark brown telescope. Aragorn's head is double-sided; one side has an angry or focused expression, while the other side has a more neutral expression. His body an legs are printed with a dark blue tunic with gold trim. His legs are dark grey. The tunic has is printed with the white tree of Gondor and six stars surrounding it. The tunic has a grey belt with a silver buckle. The Evenstar is printed hanging from Aragorn's neck. His legs are printed with a continuation of the tunic. His cape is two sided. The outer side is black and the inner side is dark red. He is equipped with a sword. Aragorn II Elessar was the son of Arathorn II, descendant of Isildur, First King of Gondor. Aragorn was also the sixteenth chieftain of the Dúnedain of the North, and the heir to the kingdoms of both Gondor and Arnor. His sword was Andúril, forged from the shards of Narsíl, the sword of Elendil (Isildur's father). It was broken at the Last Alliance of Elves and Men, and soon after was used to cut off Sauron's Ring finger. During The Return of the King, it was reforged, and re-named to Andúril. Aragorn was a member of the original Fellowship of the Ring, a sworn ally to Frodo, an old friend of Gandalf the Grey, brother-in-arms to Legolas and Gimli, and comrade to Boromir. When Boromir was slain at Amon-Hen, Aragorn honoured his fallen friend by wearing his wrist braces bearing the White Tree of Gondor. He also carried a curved Elf knife, a sword, the sword Andúril, a bow, and a utility knife attached to the scabbard of his original sword. After the end of the War of the Ring, he became King of the Reunited Kingdom. He was the lover of Arwen Undómiel, and later, her husband. Aragorn is a descendant of the lost line of the ancient kings of Men. To protect him from enemies, the Elves raised Aragorn, and his royal identity was kept secret, even to him, for many years. His Elven name is Elessar. Aragorn is the wise, valiant and loyal protector of the Hobbits and The Fellowship of the Ring. He has fought many battles but still sees the best in all people. He is ready to go with Frodo to the very end, to the fires of Mount Doom to save Middle-earth. That's all well and good, but he still has many things to learn about second breakfasts. Aragorn Aragorn is a descendant of the lost line of the ancient kings of Men. To protect him from enemies, the Elves raised Aragorn, and his royal identity was kept secret, even to him, for many years. His Elven name is Elessar. Aragorn is the wise, valiant and loyal protector of the Hobbits and The Fellowship of the Ring. He has fought many battles but still sees the best in all people. He is ready to go with Frodo to the very end, to the fires of Mount Doom to save Middle-earth. That's all well and good, but he still has many things to learn about second breakfasts. This page was last edited on 19 March 2016, at 04:28.